Finish your look with this light up lightsaber. 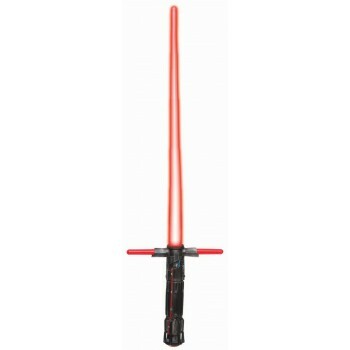 Kylo Ren built his own lightsaber but it is so unstable, it has two extra beams out the sides just to sustain its power! Includes one three-bladed saber. Approximately 91cm in length when extended. Please note: this is a fun toy, but it is not designed for one-to-one combat to destroy the universe! Requires 2 AA batteries, not included. This lightsaber dimly lights up and is best seen in a dark room.